Wireless networks represent an inexpensive and convenient way to connect to the Internet. However, despite their applications across several technologies, one challenge still remains: to understand the behavior of wireless sensor networks and assess their performance in large-scale scenarios. When a large number of network nodes need to interact, developing suitable analytical models is essential to ensure the appropriate coverage and throughput of these networks and to enhance user mobility. This is intrinsically difficult due to the size and number of different network nodes and users. This book highlights some examples which show how this problem can be overcome with the use of different techniques. 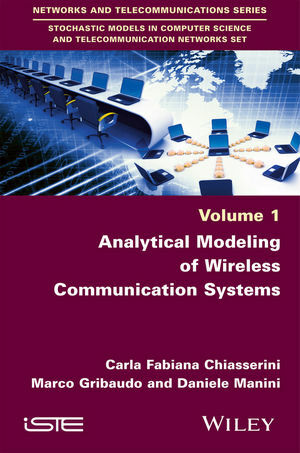 An intensive parameter analysis shows the reader how to the exploit analytical models for an effective development and management of different types of wireless networks. Carla Fabiana Chiasserini is Associate Professor in the Department of Electronics and Telecommunications at the Polytechnic University of Turin in Italy. Marco Gribaudo is Associate Professor in the Department of Electronics, Information and Bioengineering at the Polytechnic University of Milan in Italy. Daniele Manini is Assistant Professor in the Computer Science Department of the University of Turin in Italy.